In South Florida, golf carts are frequently used for primary transportation, particularly in smaller communities or retirement areas. Although many people assume that golf carts are safer than cars, the truth is that it is still possible to get into a serious accident in a golf cart. Here are the most common golf cart accident injuries, and what steps to take next if you or a loved one have been involved in a golf cart collision. Although golf carts are designed to go up to 15 miles per hour, you can still get whiplash if you strike something at this speed. Whiplash occurs when the head snaps forward and back, and the neck is extended beyond its normal range of motion very quickly. Many people who have been involved in golf cart accidents have experienced whiplash when their golf cart hit a tree, a car, or another golf cart. Soft tissue injuries are common in golf cart accidents that involve the driver and/or passengers falling out or being thrown from the golf cart during the accident. Soft tissue injuries can include bruises, scrapes, lacerations, friction burns, and more. If an individual is thrown from a golf cart during an accident or falls out, there is also the possibility of broken bones or fractures. This is particularly true of accidents involving elderly individuals, who are already at risk for broken bones due to age and health status. Head injuries also frequently occur in golf cart accidents. Both open and closed head injuries can occur when the driver or passengers in a golf cart are thrown from the vehicle or fall out, and closed head injuries can occur simply due to the force of the golf cart if it strikes another object at full speed. Head lacerations, concussions, and other head injuries are not uncommon in accidents involving golf carts. If you or a loved one have been involved in a golf cart accident, it’s critical that you take action right away. 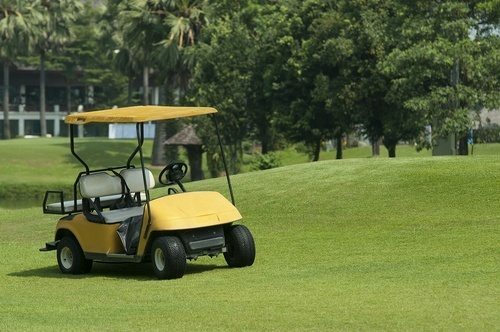 At the Slonaker Law Firm, we have represented many victims of golf cart accidents and their families, and we can apply our unique skills and resources to your case. We are dedicated to providing our clients with comprehensive legal representation, and we will work hard to see your case through to a successful conclusion. Our golf cart accident attorneys will review your case thoroughly to determine where its strengths and weaknesses lie, and we will passionately advocate for a positive resolution. Contact us today for a consultation to discuss your case in detail with an attorney by calling 352-629-6656 or toll free at 888-629-6656.